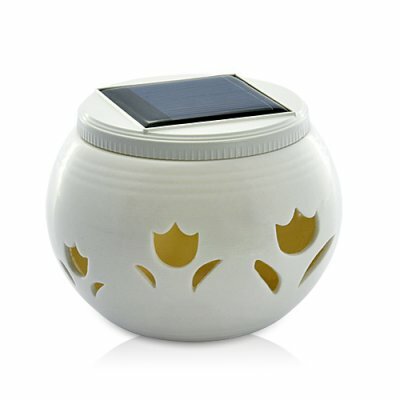 Successfully Added Chinese Ivory Ceramic Solar Light Jar with Flower Cutouts to your Shopping Cart. Lift up your spirits, light up your life with this Chinese Ivory Ceramic Solar Light Jar with Flower Cutouts! Soft ambient LED light powered by solar energy pours out of the Chinese ivory ceramic jar, through the cute little flower cutouts and creates an atmosphere of warmth and sparkle in dark places, with the cutouts casting interesting patterns around the light jar. Suitable for restaurants, bars, clubs, hotel rooms, or bedrooms for romantic mood lighting. Unlike most solar light jars sold on the market that use fuse glass or dolomite ceramic, this one features authentic Chinese ivory ceramic (which in ancient China was only enjoyed by Kings and Nobles) to bring out even light distribution and an elegant look. Inside the elegant-looking ivory ceramic jar is a highly efficient solar cell to capture and store solar power during the day. When night falls, the jar will automatically light up, offering you two modes to choose from: constant white or color changing RGB. Offered at an amazing wholesale price, this incredible solar light gadget is in stock for immediate shipment worldwide. Order today and get it within a week wherever you are. Available from the leader in LED gadgets and toys, Chinavasion. Lasts over 8 hours on a full charge - use it all night long! Can I use this LED gadget outdoor? No this LED gadget is for indoor use only. How do you charge this light jar? Just leave it under direct sunlight, it will charge automatically. How do you change the colors on this LED gadget? It is completely automatic, so just sit back, relax, and enjoy! Can I use the light jar in day time? Yes, simply turn it up side down, it will light up automatically, however, the light is very faint in day time. It’s recommended to be used after night fall.